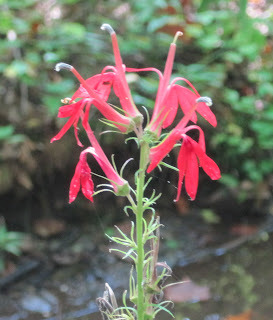 When a gardener visits the Great Smoky Mountains National Park, she finds wildflowers blooming including this cardinal flower, Lobelia cardinalis. And she wishes she had gotten some seeds for these for fall sowing. 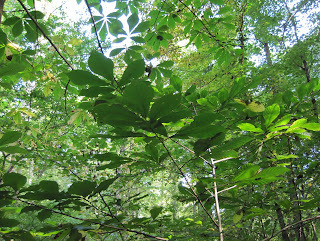 She walks on a trail and sees this paw-paw tree and thinks that her garden needs more shade. And she thinks about how the paw paw tree, Asimina triloba, is one that will grow in Indiana and that the fruit is supposed to taste like a banana so some people call it by its nickname of "Hoosier banana". After a short hike, she gets in the car and drives up to Newfound Gap, which is at elevation of 5,046 feet. From there she can see North Carolina since she is standing on the state line between it and Tennessee. And she is reminded that she will be in North Carolina next week for another trip. Leaving Newfound Gap, she gets back in the car to head further up the mountains to Clingman's Dome, the highest point in the park with an elevation of 6,643 feet. It is a mere seven miles from Newfound Gap. The gardener drives and drives some more and at one point wonders why she is driving downhill to get to a higher elevation. After about ten miles she begins to think that she might have missed a turn somewhere. Eventually she sees signs for the Mountain Farm Museum and turns in there to see where she really is and what is there. 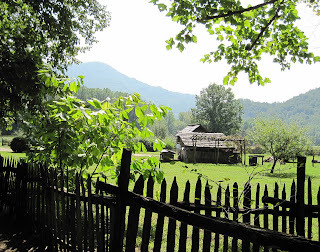 And she finds a picturesque setting with a log cabin and many outbuildings. 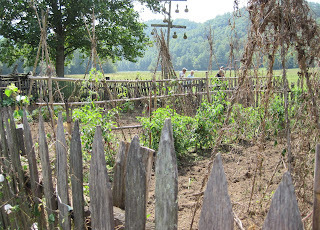 Once there she explores the farm a bit and lo and behold, she finds a vegetable garden. It's a little past its prime but its a garden none-the-less. Then she goes inside the visitor's center there and talks to the park ranger who shows her on the map where she is and where she was and it turns out that she is a long way from Clingman's Dome. The park ranger says she is not the first person to miss that turn and end up at the farm. So she gets back in the car and heads back to where she came from and eventually she finds Clingman's Dome. At least she has found the parking for Clingman's Dome. By now it is well-past lunch time so she doesn't take the steep hike all the way to the actual top of Clingmans' Dome. 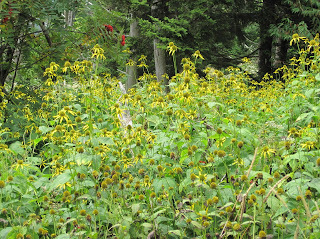 Instead she admires the wildflowers along the lower part of the walkway, including what she thinks might be the Wild Golden Glow, Rudbeckia laciniata. And she decides that the long way from Newfound Gap to Clingman's Dome via the Mountain Farm Museum is really the best way to go when you're a gardener because it means you get to see a garden along the way. Many thanks to all who joined in for Garden Bloggers' Bloom Day. Fall is arriving all over the northern hemisphere which means for some gardeners, the garden is winding down. For others, it is a breath of cool air and a second gardening season is just beginning. At the Great Smoky Mountains National Park, the trees are for the most part still green, although here and there you can glimpse a tiny bit of color in a leaf or two. One of the "locals" told me he thought the fall color would be spectacular this year because of all the rain they've had this summer. I'll miss the big tree show but will always remember... when a gardener visits the park, somehow she'll end up finding one of the few gardens there. It must be some kind of special internal compass that instead of pointing to N, north, it points to G, garden. I visited some of those very same spots this summer. The hike up to Clingman's Dome is tough, but worth it. There were some nice flowers blooming when I was there. A TON of monarda near the path up to the dome. That's pretty neat how it worked out. Taking a wrong turn often turns a trip into an adventure. The Smokies are beautiful. OMG, you are so close to me, and/or Christopher. I hope you can swing by on your return trip? If so leave me a comment on whatever post you want and I can send you directions. Have fun at the GWA! You weren't lost, you were having an adventure ... the very best kind! Thanks for sharing it with us! It sounds like you had a great time Carol. Of course you would find a garden to view. I think you should get a paw paw tree. It won't be too big for your garden either. It is the only host plant for the Zebra Swallowtail butterfly too. You could have those butterflies in your garden. 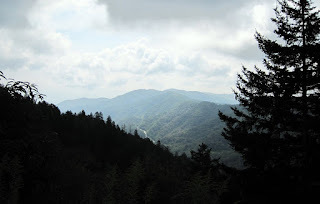 I've been on that hike up to Clingman's Dome several times. It'll make you huff and puff. You're visiting one of my favorite places since childhood, Carol. Enjoy the sights. I'm a big fan of the Smoky Mountains. You may have even passed by the school I used to teach at if you drove into Townsend, TN. We would head up there 3-4 times a year when we lived their. Peak seems to come in October. Beautiful scenery. It took five years of living near there to finally see the black bears, then we moved. Have fun at GWA! Isn't that a beautiful area? I love to visit there. You were in my neck of the woods. I can save you some cardinal flower seeds if you want. I have them in my yard (along with another 100+ wildflowers--it's a great area for plants). 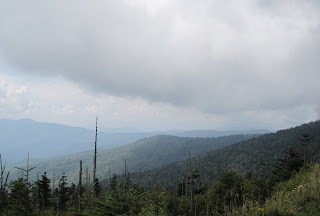 By not going up the trail at Clingman's Dome, you missed the turtleheads near the top. And too bad you weren't at the Farm Museum a few days later: this Saturday is their fall festival. What a lovely area! It's so fun to find unexpected places while traveling. Have a great time at GWA! All, thanks for all the comments. It sounds like the Smoky Mountains is a favorite of many. Dave, yes, I did pass through Townsend, but didn't notice a school. Frances, my trip wasn't that long this time, I'm already back home again in Indiana, but I'm sure I'll go back and maybe we can plan in advance for a visit to your garden. Susan, wow, I'd love some seeds of cardinal flowers to try. I haven't checked but hope they are hardy in zone 5! I can't believe you came to North Carolina lured by the garden at the farm museum in Oconaluftee just outside Cherokee NC and didn't keep going to my house. You were so pointed in my direction. Another 45 minutes and you would have found me. Or not since it rained all day and I wasn't outside. I have a dried up old vegetable garden too. Now Raleigh is a lot further away. It will take longer for you to get here. Cardinal flower is one of the first flowering natives I remember discovering in the woods of northern Ohio at an early age. It is just as vivid in my mind today as it was way back then. Serendipity Carol! That's what it's called when you get lost and find something even better. We visited those same spots last October, and the colors were wonderful! Did you see Cade's Cove?